I cycle past this church often - or, at least, the top of the lane that leads down to it. Traffic rushes along the busy Ipswich to Sudbury road not far off, but there is a quieter, parallel road which not many people seem to know about. It leaves Ipswich via Bramford, and you can get all the way to Sudbury on it, taking in the likes of Burstall, Kersey and Waldingfield on the way. Aldham as a village is little more than a straggle of houses, but they lie along this road, and just beyond a cluster of houses you take a sudden turn to the left, on to a pretty track to Aldham Hall. Down through fruit trees you descend, until the walls become older, and there at the end are the farm buildings. Beyond them, is this pretty church. If the church is pretty, the view from it is doubly so - to the south, the land drops away alarmingly, into a valley full of sheep. 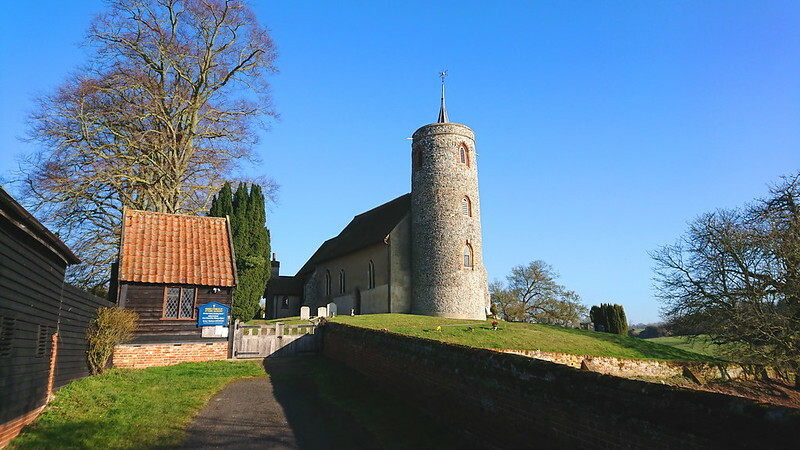 You may even think you recognise it, and you could well be right, for the second season of the popular TV series The Detectorists was filmed here, as a small display in the porch of the church reminds you. 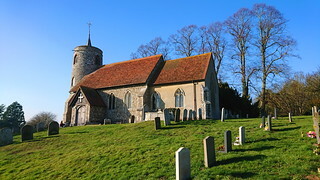 The church appeared in the opening credits of each programme, the two main characters searching for buried treasure in Aldham Vale below the churchyard. This is lovely, and splendidly English. Nothing could be more peaceful. But beyond, the land rises to a dark sea of trees, the mysteriously named Wolves Wood, now an RSPB reserve. Looking along to the right, the other hilltop is where the Protestant preacher Roland Taylor was burned at the stake in the 1550s, a site of pilgrimage for his many American descendants - and, more unhappily, for extremist protestants. Ian Paisley, the late former leader of the Democratic Ulster Unionists, was a regular visitor. Whatever your reading of the English Reformation, Taylor's burning was a terrible event. One imagines the villagers gathered outside this church, watching the flames and smoke rise. I remembered the first time I came here, back in the 1990s. We arrived on one of those humid, overcast summer days, on our way to the Bildeston Beer Festival. My young children scattered off to play hide and seek with their mother in the precipitous graveyard. An elderly man was pottering about, looking at 19th century graves, so I apologised for my family (as you do). But he seemed genuinely pleased that they were running about like mad things. He was tracing his family, and had come down from Norfolk to look for a particular grave of an ancestor. And he'd found it. He was pretty pleased about that, too. 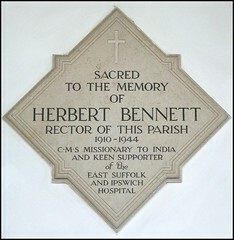 He was also following up a theory that his ancestor had been a Rector of this parish. His address had been Aldham Rectory. Did I have any idea how he could find out? I suggested that the church might have a board of 'Rectors of this Parish'. Many do. These are a pleasant Victorianism, intended to overcome the 16th century breach by claiming a history of the CofE that extended back before the Reformation. We could go inside, and take a look. And we did - the church was militantly open, the inner door wedged wide. We found the board - but the name wasn't there. So, the mystery remained unsolved. This church was derelict by the mid 19th century, and underwent a fairly late restoration, in 1883. The tower was rebuilt, as was the south wall of the nave. The roofs were replaced, giving an overwhelmingly Victorian appearance - although Mortlock detected the Norman, and possibly Saxon, ancestor. The hill itself suggests a very early foundation, perhaps on a site of pagan worship. 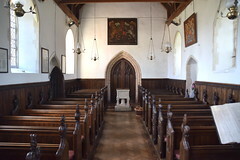 The architect was W. M. Fawcett, and there was another restoration of the inside in the early 20th century under the eyes of diocesan architect and renowned antiquarian H Munro Cautley. The resulting interior is one of those neat and shiny jobs that is certainly grand, and pleasant enough, but rather dated now. Our early 21st Century spirituality seems to respond more to dusty, ancient interiors than to these Victorian ritualisations. 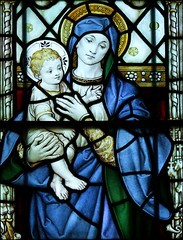 But I had a sense of a church that is much loved, well-cared for, and used regularly. And that is still so today. 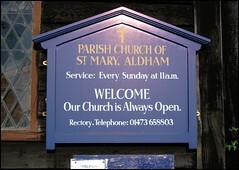 Now, Aldham parish have gone one further than a wedged-open door, and a big sign has been erected at the bottom of the lane proclaiming that Our Church is Always Open, and so it is easy to step into its prayerful interior. And it is not without its medieval survivals, a couple of which are fascinating. 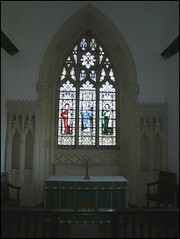 For a start, there is the chancel, with its original roof, some fine windows, and a piscina in the sanctuary. But best of all are two bench ends. These are unlike anything else I've seen in Suffolk, and their primitive quality suggests a local origin. The one to the west apparently shows a bear, or possibly a lion. 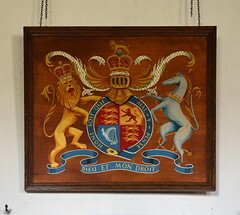 My first impulse was that it was some kind of heraldic device, but on reflection I thought differently. Note the shaved off object it holds in its mouth. And is the pattern emerging from beneath the head really fur? Back in 1999, my six year old took one look at it and decided that the creature isn't eating the bird, but the bird is flying out of its mouth. Could it be a dove? And could the three objects issuing from beneath the head actually be tongues of fire? In which case, could this be some strange composition representing Pentecost, and the descent of the Holy Spirit? In the spandrel above the bear, or whatever it is, there is a lily, the symbol of the Annunciation. But it is also a symbol of the crucifixion. It calls to mind the rare lily crucifixes, of which just two are known to survive in Suffolk, at Long Melford and Great Glemham. Could this be an unrecorded third? The other bench end is probably easier to read. The crown is obvious enough. The star and crescent are familiar from representations of the crucifixion. The pike is a familiar instrument of the Passion. And, if you look in the spandrel above, you'll see a crown of thorns, so this may well be a composition representing the Passion. A third bench end, to the east, shows just a simple spiked tool, that looks as if it might have been used in thatching. So, what's it all about? They are all a bit of a mystery, really. Coming back in 2019 I found no obvious or easy answers to offer. And what of the font? This is mysterious too. 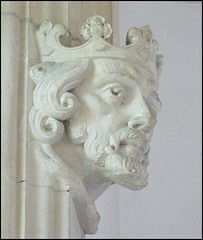 It appears to be Norman, but a second glance finds it too elegant, too finely detailed. The pillars are almost Classical in design, and the whole piece has a touch of the 18th century about it. Was it brought here from somewhere else in the 1880s? Or is it a Victorian recutting of a Norman predecessor? Whatever, the revealed brickwork of the late medieval tower arch looks most fitting behind it. The doors are, presumably, part of the 1930s interior restoration - indeed, they have a touch of Cautley about them. 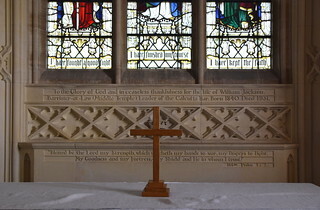 To see Cautley's work in its full glory, step up into the chancel, for the reredos and flanking niches. It looks like something out of a French cathedral. Cautley was usually a safe pair of hands in these churches he loved so well, but I wonder what he had been thinking to impose this triumphalism on this pretty little country church. Alfred Wilkinson's contemporary glass above it suits it well, but even so it is rather hard to imagine the same thing happening today. Postdating it by a couple of decades is a set of arms for Elizabeth II above the south doorway. Unusual, East Anglia has no more than half a dozen sets, and these ones are rather good. Standing in the nave and looking east, the splendour of the reredos imposing itself on our view, it is hard to imagine the real glory that once was here. But John Nunn contacted me, to tell me about a will he has a copy of. 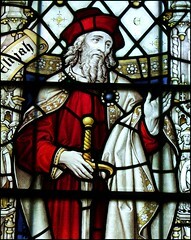 In 1525, his ancestor Robert Clifford declared: I bequeath I will have the rood there upon the candlebeam set up higher and Mary & John and two new angels and the breast under the rood korvyn and when that is done I will have all this painted and guilt whatsoever the cost. I will have bought two standards of brass stand in the choir and I will my executors bestow therein 40/-. I will my executors shall buy four candlesticks of brass for the candlebeam, I give six kine unto the church of Aldham to keep my obit with as long as the world stand. Robert Clifford was paying for a simple rood to be made more glorious. He was going to have it placed higher, with a new canopy of honour. He was paying for brass candlesticks to replace wooden candlestocks. Why? Simply, the medieval economy of grace depended upon the living praying for the dead, and the dead praying for the living. 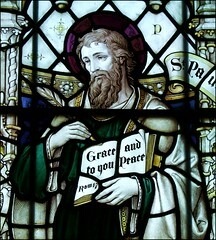 In donating glorious things to his church, Clifford was ensuring that he would be remembered. 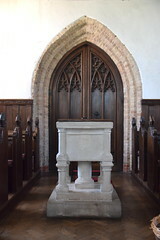 The roodscreen would have a dedicatory inscription with his name on. He was saying - I won't forget you, don't you forget me. The Catholic liturgy formalised prayers for the dead in the form of obit masses.These were said on the anniversary of someone's death in perpetuity. The proceeds of the sale of the six cows (kine) would be invested, probably in land to be rented, to pay a priest to say these masses - as long as the world shall stand; that is, for ever. Unfortunately, 'for ever' didn't last very long. Prayers for the dead were declared illegal by the protestant reformers in the late 1530s. By 1547, every single rood in the land had been toppled and burned. 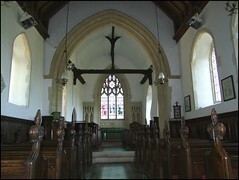 The rood lofts were hacked down, along with many of the candle beams (although about ten beams survive in Suffolk) and most of the rood screens were also destroyed (about 50 survive in Suffolk). 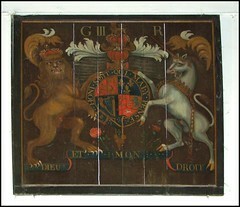 Nothing of Robert Clifford's gifts survive at Aldham. All the gilt would have been stripped, the brass candlesticks melted down, and the proceeds sequestered by the King's commissioners. The collected glory of all the churches of England was squandered by Henry VIII on high living, and on the expensive and pointless siege of Boulogne. A sad thought. 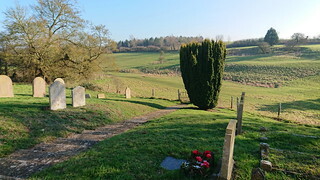 When I first came here in 1999, I remember the graveyard was full of wild thyme and especially sorrel, which we gathered in handfuls and ate later in the day with fresh trout and new potatoes. Twenty years have passed since then, and it was too early for the sorrel this year. Instead I just stood, and looked out across the gentle valley, the sheep cropping their way slowly westward. It was easy to recognise the opening of The Detectorists in the vale below. And I looked beyond to Wolves Wood, and the site of Roland Taylor's martyrdom. Hard to imagine such history happening to such a modest little parish.